Cascabel Chili means rattle chilli due to sound the seeds make inside the dried chilli when shaken. It is round and small with a thick skin and, when dried, exhibits a dark red-brown colour. Its flavour is woodsy, nutty and slightly smoky with a mild heat. It is typically toasted to produce a wonderful nuttiness. 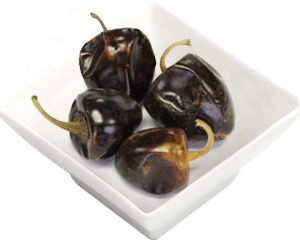 Recipes that call for Cascabel chillies are generally referring to the dried chilli. Roast the chillies and then re-hydrate them in warm water to make a paste or sauce. Add to taco and fajita dishes for and authentic mexican flavour. For complex sauces and great flavour, they can be paired with other Mexican chillies. Peppers including Cascabel chillies contain capsaicin, which is considered good for aiding in weight loss.